Three disparate individuals, a white man, an escaped slave and a Native American, are on the run together in colonial America. 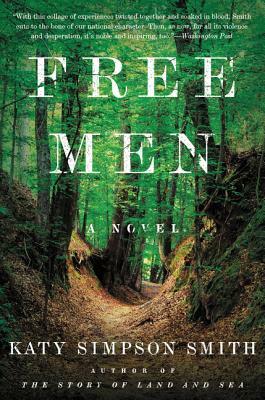 Their flight and subsequent hunt for them is the basis for a powerful novel that brilliantly examines the uniquely American concept of freedom and the often dispossessed people who helped its development. Readers can’t help being immersed in the story and intrigued by the strong concepts inherent in this unique novel. I am convinced that Katy Simpson Smith is one of Mississippi's next great contributions to the literary world. Set in 1788, this novel traces the narratives of 3 seemingly disparate men bound by a murder - an abused white man, an escaped slave, and a Creek warrior - as well as the French tracker sent to capture them. An exploration of the complicated nature of American identity, this novel broke my heart in the best way possible. From the author of the highly acclaimed The Story of Land and Sea comes a captivating novel, set in the late eighteenth-century American South, that follows a singular group of companions—an escaped slave, a white orphan, and a Creek Indian—who are being tracked down for murder. In 1788, three men converge in the southern woods of what is now Alabama. Cat, an emotionally scarred white man from South Carolina, is on the run after abandoning his home. Bob is a talkative black man fleeing slavery on a Pensacola sugar plantation, Istillicha, edged out of his Creek town’s leadership, is bound by honor to seek retribution. In the few days they spend together, the makeshift trio commits a shocking murder that soon has the forces of the law bearing down upon them. Sent to pick up their trail, a probing French tracker named Le Clerc must decide which has a greater claim: swift justice, or his own curiosity about how three such disparate, desperate men could act in unison. Katy Simpson Smith skillfully brings into focus men whose lives are both catastrophic and full of hope—and illuminates the lives of the women they left behind. Far from being anomalies, Cat, Bob, and Istillicha are the beating heart of the new America that Le Clerc struggles to comprehend. In these territories caught between European, American, and Native nations, a wilderness exists where four men grapple with the importance of family, the stain of guilt, and the competing forces of power, love, race, and freedom—questions that continue to haunt us today. “Katy Smith made an auspicious entrance with The Story of Land and Sea. Now, in Free Men, she confirms her status as a truly distinctive and lyrical voice and in my judgment, the most sophisticated historical novelist of her generation. “…[a] quietly graceful and lushly-written novel….